Why Chris Pratt and Jennifer Lawrence couldn't save Passengers. 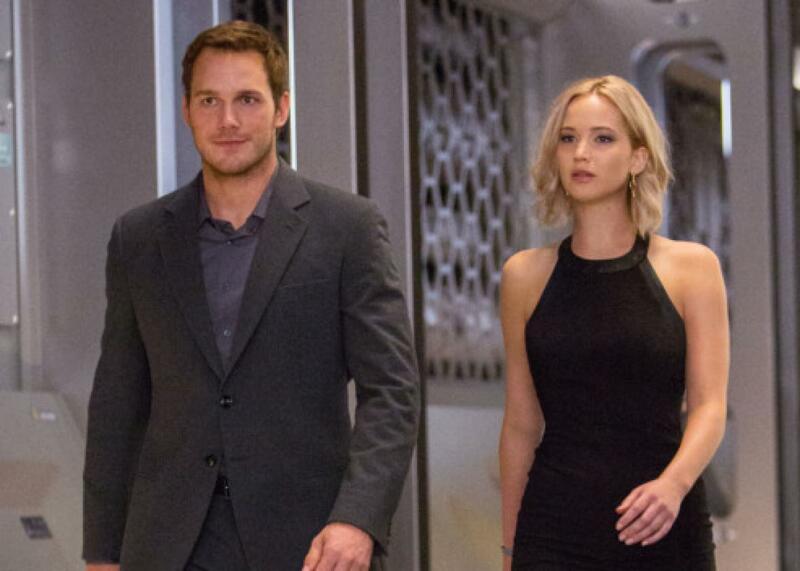 Why Can’t Chris Pratt and Jennifer Lawrence Save Passengers? Blame the Script. Seriously, not even they could salvage this script. Jennifer Lawrence and Chris Pratt are in a movie together. This is a big deal. When I say that Lawrence and Pratt are our two most likable young movie stars, I can point to evidence, like Vulture’s own Most Valuable Stars list, which has Lawrence at No. 1 overall and Pratt as the most likable. But you also just know it, intuitively, like you know that dogs are friendly and bears are not. It’s an elemental part of both actors’ personas; it’s what lifted them to megastardom in the first place. This innate, undeniable, nuclear-grade likability makes it surprising, then, that Passengers, the movie they star in together—directed by The Imitation Game helmer Morten Tyldum, from a screenplay by Prometheus writer Jon Spaihts—has been met, at least by critics, with a sticking-out of the collective tongue. While New York’s David Edelstein “was on its side and then some until its bummer of an ending,” most reviews have been far less positive than that qualified praise; the movie’s Tomatometer currently stands at 31 percent, and its Metacritic score of 43 puts it right between two other notable imbroglios of 2016, Suicide Squad (40) and Batman v Superman (44). Although the public at large can still vote with their pocketbooks, that isn’t the reception you’d expect for the first meeting of such high-wattage leads. Of course, famous actors are in bad movies all the time: Lawrence had a project with her Silver Linings Playbook co-star, Bradley Cooper, go direct to video on demand just last year. But Passengers still represents a particularly intriguing version of this phenomenon, the roots of which have to be traced back nearly a decade. In 2007, Spaihts’ screenplay for Passengers placed third on that year’s Black List, Hollywood’s annual career-making assemblage of the unproduced scripts most popular among polled executives. At the time, Keanu Reeves’ company was attached, and Reeves intended to play Pratt’s eventual role opposite Rachel McAdams, with TV vet Brian Kirk directing and the Weinstein Company producing. But that version of the project fell through, and it eventually made its way to Sony, where it was propelled toward a green light by the runaway success of the Pratt-led Jurassic World. The Black List is a strange beast, and its scripts tend toward three categories: biopics and true stories; high-profile scripts, often from A-list writers, that already have producers attached; and dizzyingly high-concept screenplays that are designed more to serve as calling cards for their authors than to actually ever get made. While Passengers might seem like an example of the third category, Reeves’ involvement made it more than just a stunt, even if the character he would play, Jim, didn’t speak to another human being for 35 pages—not typically the kind of thing that makes an executive from a major studio pull out his or her giant-check-sized checkbook. (Throughout this piece, I’m referencing a widely circulated draft from 2007, the year the script made the Black List.) Prior to that moment, which would come about half an hour into the still-hypothetical movie, Jim wheels around the ship, trying to confront and comprehend the realities of life alone, not to mention the dilemma of whether to wake up another person, Aurora, the character who would be played by Jennifer Lawrence. But what sounds like a tough sell in the abstract is easily the best part of Spaihts’s script, just as it would become the best part of Tyldum’s movie, and those first 30 to 45 pages were largely the reason why it became an object of fascination in the industry. Instead, it’s when Aurora enters that the screenplay starts to show the same strains the filmed version does. In the film, both Jim and Aurora feel slim as characters, but at least Aurora has a backstory: She’s a writer, traveling to Homestead II in order to escape as well as replicate the legacy of her father, who was also a writer—and, as she tells Jim, a writer who wrote about his life and experiences, of which Aurora has none. Hence, the journey, which she would at least get to do in gold class. In Passengers, that motivation never feels like enough; it’s hard to buy the idea that a person sacrificed every relationship she’d ever had just for good writing material, material that would never be seen by any of the people she’d known up to that point. When she says her plan was to stay on the planet for just a year and then fly back—sacrificing another set of relationships for the sake of her ambiguous project—it doubles the sense of skepticism. That’s not adventurous; it’s sociopathic. Nobody strands me on a spaceship for a hundred years. I work for the New Yorker. I’ll write an exposé so hot you’ll need oven mitts to read it. I boarded the Excelsior on assignment. Maybe the most ambitious writing assignment ever given. But things have taken an unexpected turn. I’m not writing for the New Yorker anymore. I’m writing for me. Between the way it’s employed and the fact that the New Yorker will not, in all likelihood, be around six centuries into the future—no shots—it’s hardly surprising that the film chose to drop this detail. But the new backstory leaves Aurora crucially shallow, though at least in that way she matches Jim, who is never granted anything more, in the movie or the script, than the fact that he’s a mechanic. No family, no friends, no history, or beliefs: just a profession and the vague desire to be useful. The culmination of the film, which feels cobbled together from a bunch of other space movies—a tumble into the blackness of the cosmos plays like a Xerox of a scene in Alfonso Cuarón’s Gravity—suffers from the same exact problem, failing to give much of a narrative to the characters at its center. They fall into, out of, and back into love; the juicy ethical dilemma becomes a story device, and then an afterthought. Meanwhile, the script concludes fairly differently: There are no escapades in space and much less action-movie fighting against the clock; in a horrifying turn, the ship ends up inadvertently ejecting some 5,000 passengers and crew toward their deaths, mostly so that Aurora can see the fact that Jim woke her up as a good thing, rather than the unforgivable moral wrong it might otherwise appear. Using frozen ova and sperm from the now-discarded passengers, Jim and Aurora repopulate the ship, though it isn’t quite clear how, and when it lands on Homestead II, generations come piling out. This ending wouldn’t have saved the film; there’s a good chance it would’ve made it worse. But at least it’s more distinct than the bland resolution the movie went with, and that again hits on the issue that Lawrence and Pratt come up against: They’re too good at acting for a script this underdeveloped. The material can’t support actors of this clarity, and the seams show from start to finish. When Aurora learns of Jim’s decision to wake her up, Lawrence embodies her rage and fury with such vibrating conviction that it’s nearly impossible to imagine she could forgive him. And the movie does push her much further down that path than the earlier script, which depicts her reaction as closer to depressed disappointment than the pure, homicidal hatred Lawrence conjures; unfortunately, that just makes it even less believable when she eventually takes him back. Pratt, for his part, lends surprising character to a role without much in the way of it, mostly by playing himself. But when his likability is put in service of such a brutally amoral choice, it doesn’t create an intriguing dilemma; it mostly just seems like a calibration error. In the film, Jim almost kills himself just before he sees Aurora for the first time—a moment that’s also not in the earlier script—and just as when Lawrence approached the brink of murder, it’s Pratt’s most poignant moment. But these sharp extremes stand out in what is otherwise an out-of-focus portrait. And Lawrence and Pratt are nothing if not in-focus actors, steering straight into the crux of whatever moment they’re playing. A film that’s never quite sure what it wants to be is a bad fit for two actors who know exactly who they are.